427 publishing houses from thirty countries – that’s the Doha International Book Fair, which launches November 29 and runs through to December 8. With the Arab book fair season well under way, close to five million people having already attended MENA book events so far (over two million each at Sharjah and Algiers), and many millions more will before the intense summer temperatures wind the book fair season down. While many outside the Middle East North Africa region regard MENA as a publishing dead end the reality is quite different, with three of the ten largest book fairs in the world happening here (the aforementioned Sharjah and Algiers and the world’s number one literary event by visitor numbers, Cairo). 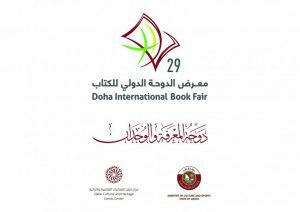 Qatar will be one of the smaller book fairs, but not one to ignore. Organised by the Qatar Cultural and Heritage Center of the Ministry of Culture and Sports, this year’s event is located on an area of 29,000sqm, the largest ever since the fair’s inception in 1972. Doha, A City of Knowledge and Conscience. 130 years? A reminder that while Qatar only gained independence from Britain in 1971, it has a long and rich history, and in fact evidence of human occupation of what is now Qatar dates back over 50,000 years. The Qatari Book House, the oldest public library in the Gulf, is to be renovated and preserved as an archaeological building. For the 29th Doha book fair incarnation, at which Russia will be guest of honour, the event has a new website (click here for the version in English). We resort to the publications law in the country. The publishing houses have been informed of this law, which includes preserving the values and principles of the society, without prejudice to beliefs, incitement to hatred, or violence, which is unacceptable in most countries of the world, stressing that Qatar is keen on freedom of thought, but in accordance with the responsibility specified by the law. Which on the face of it is fair enough. Even the most liberal of western countries do not have total freedom to publish, as I explored in a TNPS post last month. Hopefully the Doha book fair can avoid the censorship controversy that overshadowed an otherwise exciting Kuwait book festival.